When I saw this double-sided organic tote in the latest issue of InStyle, I just smiled. Doesn't it make you smile? Simple. Cute. Perfect V-day gift. Oh wow that's really cute! I'd love to receive one of those someday! Fun find! Super cute! I've been looking for a tote for all my Bible study things. I need, want and must have!! Oh my goodness! I'm so in love with these totes! Adorable :) Maybe I can nudge my sweetie for an early valentines present! Yes!!! 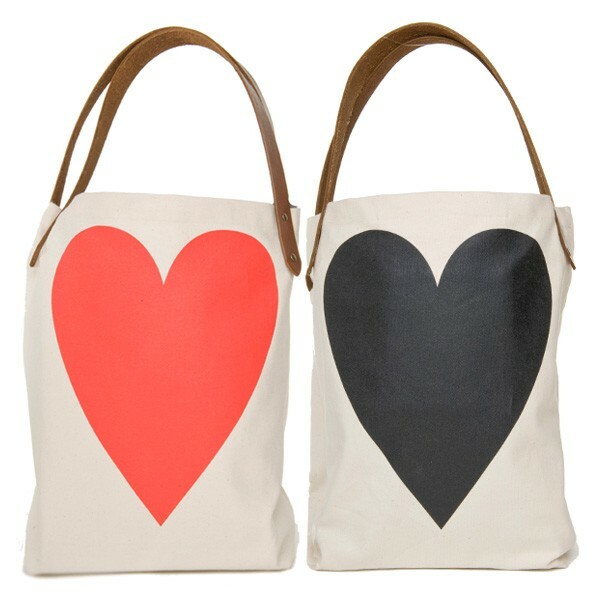 the perfect V-day gift, so so cute, but at the same time they have this industrial feeling, love them! Yes maam. That is really cute. I love it.